Pictured: The Cheese Stuffed Crust version. No way! Way! Recently, while my family was watching a rousing marathon of Jason and the Argonauts, I was looking through some old college recipe books some friends and I put together back in the day, and found a recipe that was for a gluten-free pizza crust which used rice instead of the old stand-by flour. Inspired by the success I was having with riced cauliflower, I played with the rice crust recipe, made a couple of calculations and guesses on ingredients and flavorings, and came up with a pretty amazing pizza. My kids didn’t even know it was cauliflower. And when they found out, the have been bugging me to make more, because they can’t get over how very much they like this recipe. I have to make a run to the store this morning for more cauliflower, as a result! They don’t even like other pizzas this much! I had to snap pictures quickly, because people kept trying to eat the props! Can a pizza be more perfectly pleasing? Gluten-free and low-carbohydrate enough to be enjoyed on Atkins induction? In a medium bowl, combine cauliflower, egg and mozzarella. Press evenly on the pan. Sprinkle evenly with fennel, oregano and parsley. Place under a broiler (grill for the Europeans) at high heat just until cheese is melted **. ** The pizza sauce I use is Great Value Pizza sauce from Wal-Mart. At only 3 net carbs per quarter cup, you get a lot of punch for little carbohydrate pow. *** You can try re-baking the pizza at 450 once you add toppings if desired, but the crust is not quite as crusty. There is a minimal difference, so see what works best for you. Simply put the pepperoni on a papertowel and microwave for 30 seconds before broiling it on the pizza in the oven. Fantastic REAL pizza recipe. Thank you so much! This is great! Thank you for posting this recipe! It is great because you don't need any special ingredients like soy flour, etc! Quick question – have you ever tried making and freezing this crust? If so, did you bake it first? wow, this recipe looks amazing. I'm on day 3 of atkins…looking forward to making this next week!!! I have made this twice now and I love it! My only problem has been that each time the outter part of the crust cooks perfectly, but the center always seems to be undercooked. Any tips for getting the center just as done as the outter parts? I baked mine at a lower temperature, 425 degrees, for a bit longer and the entire thing was perfectly cooked. Also, instead of broiling it at the end, I just baked it with the toppings for about 10 minutes. I think this prevents the outer ridge from getting burnt. I have to say, this was one of the best low carb dishes I’ve ever had! I am so happy to hear it! I also love reading how you made yours. Thanks for sharing! I made it again tonight….we are addicted! I used fresh cauliflower. I ran it through the food processor, sautéed it with olive oil in a frying pan – no water to drain! Baked again at 425, and waited until it was nicely brown, about 15 minutes. Made 2 of them. One with roasted red peppers, garlic and onions. The other with garlic, mushrooms and pepperoni. Holy cow! I am an unmediated diabetic and my blood sugar is stabilized with this meal! Again, I thank you! This is all very helpful. I made this last night and had the same problem as Magno101. It was just falling apart making it difficult to eat. Will try it again with these few extra tips. Thanks, guys! 1. Try plopping little bits of dough all over the pan instead of in the center and pressing outward. This seems counter intuitive to the way we've always pressed dough out, but this way you don't end up with inordinate amounts of cauliflower dough in the center. 2. After the dough bakes initially, run a spatula around the edges and see if you can flip the crust over to bake a little bit longer. Obvs, this means smaller rounds, but it ensures even better doneness on both sides. I've had great success with both methods, and tend to use them together whenever possible to ensure even greater success. I was SO excited to make this crust, it looked great up until I tried eating it. The whole thing was soggy except for the crust 🙁 Any tips? I think maybe the cauliflower was too wet when I riced it. Definitely make sure you squeeze out any excess water prior to adding to the egg and the cheese. I usually squeeze it out once or twice prior to making it into the dough because of the water content. The same goes for zucchini. And usually what might be mushy the first day is better the second, since the crust has time to dry and solidify. I think the cauliflower could be cooked in the microwave after riced and no water or not much.. This looks too good. Not to mention a great way to get my preschooler to eat cauliflower. We are grain-free for health reasons, and I feel like I just found a treasure trove of recipes here. This is amazing. I will definitely have to try it! 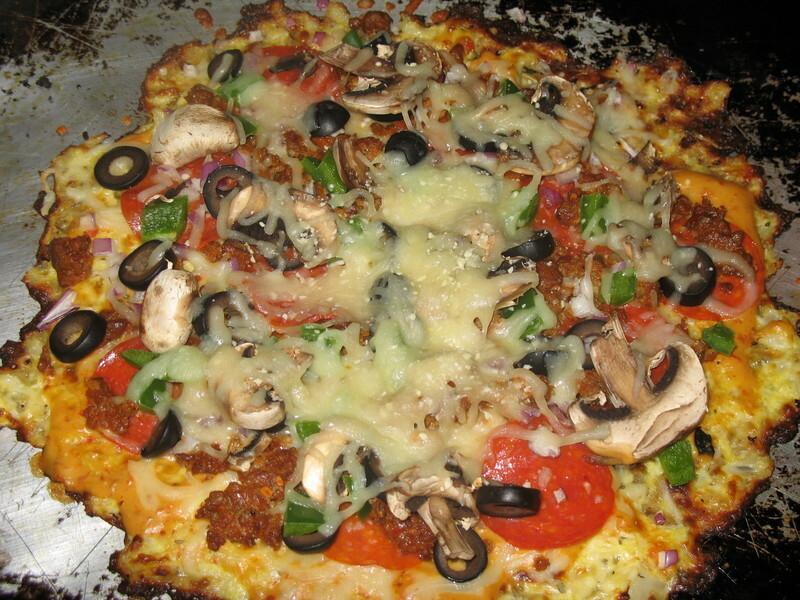 Pizza is so hard to make on a special diet, so anything pizza oriented that can be adapted to fit my needs is a winner. 😀 Thanks for sharing! Thanks so much for your kind words! You guys are the best. This is Carne from the boards. I tried this last night and it was amazing! So close to the real thing. Thanks so much!!!!!! Really good. I did have to put the cauliflower in cheesecloth and squeeze it dry. I also added 1/2 cup of parmesan cheese and that resulted in a very firm crust. I first saw this recipe on the National Examiner site and it is a keeper. THANKS. Man, you should change the recipe's name to AWESOME! I made this a few times and I looove it! This made me like cauliflower! dumb question…but how do you squeeze out the excess water? What a lifesaver of a site you have! I have a question…can you make up this pizza dough, cook it, and freeze it? I'd love to be able to make a number of them and then freeze and use when I need them. Thanks for your answer! Yes! You can totally freeze the crust once it's baked the first time. To remove the excess water, I squeeze the zukes in my fists, use a ricer, or you can put the zukes in cheesecloth and wring it out that way. You could also let the zukes dry in a colander and press lightly to push some of the moisture through. I am imploring for help! I've made this dough and tried to bake it 3 different times and it always sticks on the bottom? Hi, Roxie! I don't have sticking problems, but that's not to say it doesn't happen. Definitely try using parchment paper and see if that solves the problem if you've tried everything else with no luck. I spray the pan with olive oil spray. Then after baking, I move a metal spatula around the edges of the crust while it's still hot. Once I'm able to slide the crust around, I flip it over. I'm gonna give the parchment paper a try. Hey Mel! Yeah, that's mine. I am really pretty excited people love it! It's not a huge deal, but I would love to have a link back! This recipe may have single handedly saved my low carb diet. If you have read this recipe and have not yet made it, you MUST make it. It is so delicious. One recommendation is even though you spray non stick spray, still be sure to cook it on a truly non stick pan because it does stick a bit. Hey, Anna! I am so happy you're happy with this recipe! I have had good luck with a regular cookie sheet. What I do do is run a metal spatula all around the edges and then deeper and deeper until I loosen the entire thing up. It works really well! Then that way if you need to flip the pizza, you can. This dough recipe is a lifesaver! I made if with Cheesy Alfredo sauce (2 tbps = 1 net carb), pulled rotisserie chicken, mushrooms, and bacon. Absolutely delicious! Made two smaller pizzas and the crust cooked perfectly in a cookie sheet. 1 net carb per slice! THANK YOU! What a great way to make it, Adam! I love that variation. First of all I would like to say…You're my hero! I have been on Induction for 2 weeks and this is the 1st meal that I have loved( and the 1st without seeing an egg)! I was dreading giving up my pizzas, as I used to make homemade pizza all the time, and I absolutely abhor all the "other" flours for baking. Thank you, thank you, and Thank you! ive been making this for the last year, even hubby who hate cauliflower loves our cauliflower pizza…i personally use one cup of cauliflower, 1/4 cup of eggbeaters, 1/4 cup of ricotta cheese, 1/4 cup of mozzerella cheese, italian seasonings and mix up. i used sprayed parchment paper and flip over onto a sprayed parchment paper…using eggbeaters and less cheese for the crust also makes it lower in calories. this makes one serving..i put my cauliflower in the crusinart to chop up fine..
To help the crust bake evenly, put a pizza stone on the bottom rack of your oven – it makes the oven distribute heat more evenly. Had this tonight and it was AMAZING!!! This pizza is great, I actually didn't even follow the directions correctly and it still ended up good. I forgot to cook crust first and ended up cooking whole pizza with toppings on it at once. My husband is on Atkins and has been on and off for years and he loved it. It's tiring to keep eating the same food and this was a nice treat for him and I liked it too. I would like to post my picture and link to your webpage if you approve. I want to share your fabulous recipes and blog with others. I'd be honored! Thanks so much for asking. Let me know when you link and I'll share. wow, that was fast. I am going to post it now and I have linked it to your blog. Thanks, I can't wait to try some other recipes. There's never rest for the naughty… and those avoiding laundry. Is there a way to print your recipes off? Its late and I'm technologically challenged. When I tried to copy/paste so I could print it, it wouldn't let me. I'd love to add this to my cookbook of favorites. I made this with a group of girls and it came out awesome! We tripled the "dough" recipe for one cookie sheet size pie. If you do this, the consistency is better by removing 1/4 cup cauliflower and adding 1/3 cup grated parmesean cheese. It didn't stick, it held together and it was YUMMY! Thanks for the great recipe! Was amount omitted and added for the tripled dough recipe of do you have to omit and add 3 times that amount for the triple recipe. For triple the recipe, you say go with 3 cups veg + 3 Cups of Cheese ( What kind of cheese Mozzerella or parmesean?) when you say shred I assume mozzerella, + 3 eggs. Has any body made crust ahead of time and froze or made it ahead of the time left in refrigeraor then put topping on and cooked? I tend to use mozzarella cheese because it is a low-moisture, lower-fat cheese. It’s easier to work with in this application. You can, however, use any cheese you like best! so my husband scoffed when I said i was making this the other night…and then he was a believer! 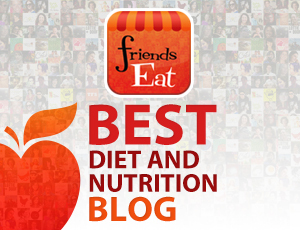 it was fabulous – and I have been on a low carb diet and craving pizza non stop! I threw on some roasted garlic, trader joes sauce, crimini mushrooms and lo cal mozz cheese – awesome!!! This pizza is fantastic. I've made it twice so far. It has a wonderful vegetabley flavor. I would like it if it were crispier or more substantial. Like another reader I also have to eat mine with a fork. It's more like a rubbery fritatta than a pizza (but still awesome tasting!). Both times I made it I heated the cookie sheet for half an hour in a 500 degree oven, listened to the sizzle when I pressed the "dough" in then turned the oven down for baking. Since the first time I made it it was a bit too eggy the second time I used less egg but that didn't seem to make it firmer. Also, I grated the cooked cauliflower finely and pressed out the moisture on paper towels first. Haven't tried really wringing it out in cheesecloth yet though. Next time I make it, I'll try flipping it over to see if that helps. Any other suggestions to get it looking like the picture? You can also try subbing out 1/3 cup of cauliflower for Parmesan cheese (grated) and see what happens! I just made this pizza, had enough califlower left for the breadsticks and yeah, I took a photo of the beeeaautiful creation and will be posting it on facebook! This recipe rocks. My sister and my neice are all going low carb and having a contest to see who drops 10 pounds first. Thanks for allowing us to do it with pizza! You mention "zukes" in your comments but the recipe only shows cauliflower. Can you substitute zucchini for the cauliflower? delish BTW. I stuck to the pan but I am going to try parchment paper next time. I am trying to go low fat too so I used vegan rice cheese and it worked amazing. Topped with soy mozzarella, red peppers and shrooms. Had to eat it with a fork but it was so good I dont even care. Thank you!!!! ps… any lower fat options are great too! My dough came out soggy. I'm not sure what happened. I blind baked it for 18 minutes, and it was browned on the bottom, and I broiled it for a few minutes to melt the cheese. Could it be because I used fresh mozzarella that was "wet"? Hi, Amy! Fresh mozz does tend to be more moist, for sure. Sometimes, though, letting the dough rest after cooking helps firm things up again as soon as the cheese is able to solidify. I do use the more aged mozzarella, so maybe I need to make sure I'm specific about which one sets up better… I love fresh mozzarella for sure! I was really looking forward to this and it just didnt work. It stuck to the pan and I couldnt even attempt to save it and eat it. Followed the recipe to a T. Good in theory I think. Hey there! I'm sorry yours stuck to the pan! Sometimes I think I need to publish a cooking video showing my method, because it's hard to explain in words. 1. Remove more of the liquid from the cauliflower. I squeeze the holy living hell out of the cauliflowetr. and then I even let it rest for about a half hour to let it dry out even more! 3. Sub out up to 1/3 of the cauliflower and sub in up to 1/3 cup of Parmesan cheese (powdered, green can) to help firm things up. 4. Use a metal spatula to carefully work around the pan while the pizza is still hot to loosen, but don't remove the pizza for 10 minutes, until it has time to cool/solidify slightly. If all else fails, use the crummy crust as noodles for lasagna, as rolled up enchiladas, or cut them on the diagonal and make chips from them (be sure to dehydrate for more crispness). Thankfully, even in a stuck-up pizza, there's a silver lining! Thank you. This was wonderful. Even the 3yr old loved it. Well, I read a few comments and I think I had all the problems you guys described, it stuck to the pan, it didn't cook in the middle and it never got crispy, it was really soggy… I'll try it again, but the first try was not good. A friend of mine made this recipe for me tonight and my first thought was, "Wow, this is great!" then she told me it was cauliflower crust and I couldn't believe it! I'm trying it on my "no-veggies-no-way-no-how" niece and nephew next. That is AWESOME! I am totally happy to hear that! I hate veggies, so I have to hide them when I can. So do you fully cook the cauliflower or just slightly? It's fully cooked, but others have had good luck just shredding the cauliflower and making the pizza with raw cauli. I like mine a little more mushy. I just tried this recipe for the first time this week and it's great! I made pepperoni pizza with this crust and no one could even tell it was cauliflower. I fried the pepperonis first on the stove to get the grease out and get them a little crispy. I set them out to dry on a few paper towels and then added them to my toppings. I will definitely be making this again! I found this and just HAD to try it. I never ate cauliflower as a kid, but have been wanting a pizza/bread replacement for a long time. I made mine following the posted recipe (except I was out of fennel…darn! )and I added a 1/2 cup of parmesan like one of the other posters did and WOW did it turn out great. I doubled the recipe and made a thin rectangular crust and baked it on parchment. The crust itself was sooooo perfect, I almost didnt want to top it with anything. But I added some low carb pizza sauce, and some sauteed mushrooms, onions and black olives, and covered it with mozzarella. I only had to broil it for less than 4 minutes to melt the cheese just right and eat. I was BLOWN away by the taste, the crunch and the house smells of pizza. Tony, that's music to my… erm… eyeballs. I LOVE hearing that you didn't even like cauliflower and you could make this a part of your food repertoire. Be sure to check out my almost 275 other recipes (including wings, Dotitos, taquitos and lasagnas) for more surprises. I am so in love with this lifestyle; seeing you fall in respectable like with these recipes makes everything worthwhile. You rock hard, my friend. Thanks for taking the time to share your experience with me. That sounds really awesome, Christine. I appreciate you sharing your vegan tip with me, too. You are so clever! Please be aware that non-stick cookware is dangerous to birds – gives off toxic fumes at high temps. Since the temp called for is 450, I would use an aluminum cookie sheet. Wowee I have just found this recipe as I am on the hunt for new cauliflower recipes. I love the sound of this and am going to try and make it today. Only thing, I don't have mozzarella cheese, do you think it will work with Cheddar? I am going to try and see – can't wait. If it fails, well there is always next time. I made this for din tonight (the pizza) SO VERY TASTY! I have been craving pizza like crazy and this was the perfect solution for me. Thanks! Yesssss! This is delicious! This is a gluten-free SCD-friendly LIFESAVER. You're a culinary genius! I am so glad, Kirsten! Thank you so much for letting me know. Especially on a cold day it's nice to have a little warm pizza lovin'. I normally don't comment much anywhere, but this is worth it. I just made this following the advice to swap 1/3 cup of cauliflower with cheese and this was AMAZING!!! I made mine with ham and pineapple bits(Hawaiian pizza style) and it was delicious. I doubled the recipe and cooked it about 16 mins on parchment paper and the crust is holding well, even with the heaviness of the toppings and it didn't stick to the pan. How did you make the bread sticks? Did you roll up the cauliflower dough? Hey Jeanine! Here is the method for the bread sticks: https://yourlighterside.com/low-carb-breadsticks-recipe/ It’s so delicious. My kids like these even more than the crust. Yay on beginning your new lifestyle! I know cauliflower sounds positively bizarre as a crust, but it works. I don’t even like cauliflower, and, thankfully, fennel goes a long way to mask the pungent flavor. Try the zucchini crust, too! I really think you’ll like them. Let me know if there are any other recipes you’d like to see. I’m here for you, woman. We have to stick together. Thanks so much! I love this crust. I hope you do, too! No, I get it; it’s not like the dough we’re accustomed to. It’s definitely a totally new flavor profile. It’s a way to mask veggies and get the pizza at the same time. If you want something less ‘cauliflowery’ you can try subbing in zucchini for the cauliflower. It’s essentially flavorless. This is a fantastic recipe and a must share! Thanks!!! So is the 1 cup of riced cauliflower measured before I squeeze the living daylights out of it or after? Can’t wait to make this, looks sooo good! 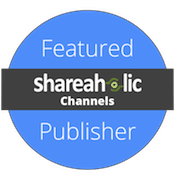 Thanks for sharing, I am excited to find your site! Hi, Jo! It’s before. Good question. If you measured after extracting the liquid, you’d really moosh down the veg and you want it slightly less packed. Hi there! You should be able to change your settings? Make sure to check your latest email and click the link at the bottom that allows you to manage your subscriptions. That is a lot of emails! If you steam the cauliflower instead of boiling it, it will stay much drier. Cauliflower when cooked in water, soaks it up like a sponge. Another vegetable which soaks up water is sweet potatoes. If you are going to mash them, steam them first and you will have much better results. Just made this pizza for dinner tonight, and it turned out fab! Even my picky, suspicious-of-“weird”-food husband ate it– and loved it. 🙂 I am looking forward to trying more recipes from your site. hi, this looks fantastic! Unfortunately, however, I’m allergic to mozzarella cheese! Do you know, is there a different cheese that would still bind the crust properly and also taste good with pizza sauce? help! Hi, Rikki! I am told that rice or soy cheese might be an option? You could also use pretty much any kind of cheese, s0o long as it’s aged, like cheddar. is the fennel so important in this? can i use something else? Hi, Jana! I use fennel because it masks the pungency of the cauliflower. You can skip it or go with different spices, but I found that fennel was an easy solution in terms of spices. Made this pizza tonight with the Cauliflower breadsticks. I riced the cauliflower first in my food processor then microwaved it for 2 minutes. Then I placed it on a towel and squeezed it like crazy!! On both recipes I cut the cauliflower to 2/3 rd cup and added in 1/3 cup of parmesan after reading some of the comments. I cooked the pizza on parchment but the breadsticks I just cooked it in the casserole dish. Both came out so beautiful I almost cried!! Best breadsticks and pizza I’ve had since a diagnosis of gluten intolerance. Love love love both recipes and am so excited to eat pizza again!! THANKS!! Yay, Niccole! You’ve made me so happy with your message! You are exactly why I do what I do. I love to help. Please totally check out the chicken crust (Easy gluten free crust) on the site sometime, too. It is so amazing! And be sure to let me know if there’s anything I can do to help. I absolutely LOVE this recipe. I discovered it a couple of weeks ago, and my boyfriend and I (who both previously loathed cauliflower) have made many incarnations of this pizza. It’s pretty foolproof and damn tasty. Thank you for your culinary genius! Hi, Emily! Thank you so much for taking the time to let me know what you guys thought of this recipe! I am not a cauliflower fan either, but I keep bags of the stuff in the freezer now. You never know when the pizza bug is going to bite! If you haven’t already, try the chicken breast/cheese crust, too. It’s on the main page under most popular recipes, and it is another terrific option. I love pizza. Has anyone tried this on a Pampered Chef (or similar) stone? Does it still stick? Connie, I think I have heard of folks having really good luck with my chicken/cheese crust on a stone, but I want to say it was told to me that the cauliflower crust might have stuck to the stone. I am not 1000% sure, but that’s what I thought I remembered. Just finished dinner, made the cauliflower crust pizza. it was fantastic. Hubby loved it too. I took the advice of others and squeezed, squeezed, squeezed the water out. I think that was the key. I made a double batch that fit perfectly in a cookie sheet as a thin crust. It was crispy and held together well, no fork needed. It’s my new favorite, thank you. Yay! I am so glad this was a hit! Thank you so much for letting me know how it came out for you! Hi there, this is a great idea! However, since I’m only renting a small place I only have a toaster oven in my room, would that suffice? I REALLY want to try this recipe! You bet! Just make those pizzas a little bit smaller and you’re perfect! I have been making cauliflower rice for years. I use food processor (shredder blade) & shred it raw, then sauté in pan (sprayed w/olive oil). I keep a lid on it, when it’s fluffy & soft, I remove lid & continue stirring (once in awhile) & let excess moisture evaporate. This is the secret to making a non-soggy pizza crust…..the cauliflower rice is cooked & evaporated moisture FIRST. Then add the egg, cheese, etc. and bake according instructions OH! & Yes on top of parchment paper, I’ve even sprayed w/olive oil the parchment just to be sure of no sticking! You rock, Debi! I love you for sharing your process and am a newly converted SIP (sister in parchment). I am vegan but would love to try this crust. It looks sooo yummy. I am wondering if I can substitute the egg for something else binding? I also can use vegan cheese, but am unsure how it would all hold together. Do you know if anyone who has tried making a vegan version of this crust? Thanks. Hi, Kathy! Absolutely! Replace the egg with flax seed meal instead (try 1/4 cup flax seed meal to replace for each egg as a binding agent). You can also use soy cheese in place of the cheese in the recipe. I am not 100% sure how it will perform. Does it melt? The cheese tends to act as a binding agent as well. I would try this: Make 1/3 of the recipe and see how it performs. As well, make the crust with raw, shredded cauliflower–uncooked. There’s less moisture that way! Would you do me a favor and let me know how yours turns out? I attempted to make this vegan by replacing the egg with flax and the cheese with Trader Joe’s Soy Mozzarella. I’m not sure what caused it to fail, but the crust did not cook properly. The Soy Mozzarella seemed to melt properly, so it was either the flax or the baking sheet (it has a layer of air to better cook, but has often caused uneven results). I’m going to try again with a better baking sheet and possibly an egg. I’ll post an update after the next try. P.S. I did not pre-cook the riced cauliflower. I just tossed the whole head into my food processor with the shredder and it went directly into the bowl with flax and mozza. Thanks for letting me know your process, Joey! I Did you try using some parchment paper? That might help. I am so glad you like the recipe! Don’t shoot yourself, though. I’m an NRA certified range safety officer. What can I replace the fennel and parsley with? I do not have these 2 herbs on hand right now. I am so looking forward to trying this recipe. Hi! You could go instead with garlic and something else. Oregano? Really, the spices are to generally combat the cauliflower’s pungency. OH. MY. GOSH. SCORE!!! This was absolutely fantastic! I added some dried, minced onion and garlic powder to the crust. Then I made it as a Pizza Margherita. I brushed some olive oil on the baked crust, sprinkled it with fresh basil and oregano (from my garden to boot!) and then added fresh, marinated mozzarella. I was really unprepared for how much flavor this had. Thank you, thank you, thank you!!! This was a hit with me. Riced a raw head of cauliflower and mixed up the dough and cooked. Yes the edges stuck but letting it cool some helped me muscle it loose. Topped with a tad of tomato sauce, moz cheese and Italian sausage then broiled. Next time I will omit the moz on the top since the crust contains enough cheese to satisfy me. Like that I’m getting veggies in my crust. Unbelieveable! Fantastic! Tastes exactly like PIZZA! My crust while thin had a Sicilian Slice taste / texture which I prefer anyway. Great recipe and super easy to make. Hi, John. Thanks so much for taking the time to let me know. I am so pleased. Definitely also check out the easy, gluten free (chicken./cheese) crust on the site, too. I think you’ll be really pleased with that one as well. I read through all the comments and I am excited to try this recipe. Has anyone tried to make this like a deep dish? I was thinking about pressing the dough into a cast iron skillet or something so I could get the Chicago style deep dish pie feel. I have made this deep dish (and bread sticks), but I almost prefer the crusts below for deep dish and as a first-time crust. It’s my newer chicken/cheese crust, and it is amazing! Last few minutes in the broiler and can’t wait to try it. My kitchen smells delicious! I had no fennel…used a bit of marjoram instead. Just wanted to ask how thick whould cauliflower crust be made mine thin and although it seemed to get brown I found it did not hold well the top ingredients. Also low fat mozzerella did not melt on top it seemed all right for crust but tasteless on top. Also think the sauce should be warmed up before since when cheece melted sauce (I did not put much) was sort of luke warm not hot. Note: cut whatever you put on small before you broil otherwise it will not heat under grill since cheese cannot stay under too long. I made my mushrooms too big, they tasted well since mushrooms can be eaten raw but were not hot. Also, someone said these can be frozen how are they when they thaw since I would think they would pick up so much moisture that they would be soggy. Also riced by raw cauliflower and then put in oven on pan to cook and dry out when I think made it not wet but although crust crusty on end still seemed stiff but not crunchy througout. Also used 3/4 cup of cauliflower 1/4 cup of parmesean and 1 cup of mozzerella and one egg. Anymore suggestion for crispier crust. Also turned it over to cook on other side. Found it also is good in glass lasagna pan sprayed and it came off fine might have to loosen some edges. Not as crisp as on pags. Also tried aluminum foil sprayed it worked then flipped it on another aluminum foil on cookie sheet that was sprayed. Only stuck in spots I made too thin. How thick should it be? Whitney, you are super sweet! Thanks so much for your positive affirmation. If you love this recipe, try my easy, gluten-free pizza crust. It is so delicious and only requires two ingredients. WOW WOW WOW! This was absolutely amazing! My son and I are bother doing low-carb & grain free. We were both really wishing we could have pizza, and then I found your website! I was skeptical, and my son even moreso…he HATES cauliflower. I asked him to at least try it and if he didn’t like it then I promised not to make him eat it again. He took his first bite and promptly declared “Mmmmmmmmmm!!! !” Winner! He finished his before I even had the chance to sit down and eat mine, and was BEGGING for more! Thank you so much for all the time and effort you put into creating your recipes, you’ve truly made eating low carb easy! Meg, I am so very happy this recipe has been a winner for you! I love hearing your experience and that your son might now be a little bit more of a fan of the cruciferous veggie. I also have an amazing gluten-free crust on the site that uses only two ingredients, so check the Main Dishes tab and be sure to check out all of the pizza options. I have bread sticks, too. My kids especially love those! I have been all over the ‘net looking at every cauliflower pie I could find…no one lists nutritional content OR what I am really looking for…The Serving Size. What is considered a serving size with this? Does anyone have any idea? I am thinking “hey there’s no carbs in the cauliflower at all, you could probably have several slices. But then again, there is a LOT of cheese in the crust and then on as a topping and so a lot of fat. Is anyone else concerned with what is considered a serving size? Hi, Teresa! Since mine is the original crust, I’m glad you came to ask me. Since 2008, I have been making–and enjoying a serving size, which is roughly 1/8th of the pizza. I found a similar recipe earlier in the year and its a staple in my house. Made one last week with toppings and hot italian sausage. I use fresh, throw my cauliflower in the food processor and grate. Put in microwave for 8 minutes, cool then add egg, etc. bake, add toppings and broil till cheese melt. Hi there! Isn’t it funny? My recipes get around more than Lindsay Lohan. I am so glad you found me! Question: Do you crumble the sausage or slice it for your pizza? I’m sure you’ve been told a million times how wonderful this crust is, and how AMAZING you are for inventing it, but here’s your one million and 1st time. This crust is wonderful and you are amazing. Thank you! Carey, I appreciate every time hearing when a recipe hits the spot. It means you like something so much you took the time to let me know. I appreciate it! I’ve been going low-carb about a month now, and your blog has saved me from giving up on the whole thing on many an occasion. I made this recipe tonight, and it was DELISH, but very floppy. Needed a fork to eat the pizza for sure. I have noticed that when I add protein powder to your oopsie recipe (especially when I tried it with the pizza crust), it makes it firm enough to pick up. Do you think protein powder would accomplish this for the veggie pizza crust as well? Thanks again for sharing all you wonderful recipes! Hi, Erin! I would think that if it works to firm up one pizza, so long as the “protein” is dry, it should firm up the other, too. GREAT RECIPE!! MY fiance absolutely loved it and so did I! I just may love you for life because of this. Also, I baked my crust longer and spread it thinner,WE DID NOT even have to use forks to eat it unless it was re-heated. (tried it last night, and will be making it again very soon!) Thank you!! besos & bendiciones. I am so so happy to hear this! Thank you so much for taking the time to write and to let me know you enjoyed this recipe. You are the best! MMMMM yum! I just made this and it was amazing. My skeptical husband even liked it. I put a 1/2 tbsp of pesto and 1 tbsp of marinara sauce, plus some natural pepperoni and mushrooms and mozza on top. It was AWESOME. I doubled the recipe and made 4 individual size pizzas. One filled me right up. I am so glad you like this recipe! Thanks so much for taking the time to report back how you prepared it and what you think. The origanal recipe above – what size pizza does it make ? dont know to double if I dont know what size ??? Hi there! I want to say this should make anywhere from a 12″-14″ pizza depending on thickness. Made this tonight and took it to book club osince the theme was Italian and I didn’t want to be tempted to cheat. Warned everyone ahead of time that it was low carb and ……..they all loved it! I am so happy it was a hit! That’s a testament to your cooking skills. I decided to give this recipe a try a couple of months ago. I have to say..it’s an INCREDIBLE substitute to regular pizza crust. My boyfriend, whom doesn’t get excited about ANY food, requests this on a regular basis. We have it almost every weekend! I’ve recommended it to family members looking to get their picky eaters to eat more veggies and they also loved it! Sooo good! I am so glad to hear it! Thanks so much for letting me know, Kelsey! How thin do you spread the mixture on the cookie sheet? Hi there! I’d like to say about a quarter of an inch to (minimally) an eighth of an inch. Any thinner and it might not hold together well. Any thicker and it won’t really brown as nicely as you might like. My husband and I absolutely loved this pizza. Was really the best pizza I have ever had. No kidding. The crust turned out perfectly using your springform pan idea from the newer chicken recipe. And I did a fast amazing sauce I found on allrecipies http://allrecipes.com/recipe/exquisite-pizza-sauce/ recipe. Topped it with balsamic sauteed red onion, sliced green olives,a bit of grated sun dried tomato, pepperoni, feta and mozzeralla cheese. My husband said he would eat it every night! You are awesome. I obviously didn’t read the recipe very closely, as I didn’t notice that the cauliflower was supposed to be cooked first! I used raw (just threw it in the food processor), and then added the egg and cheese to the FP and gave it a whirl. You can totally go raw, too. The cooking is only for frozen typically, to help remove all of the liquids. How many serving can you make with one crust? Typically a pizza serves 8, assuming 8 slices. this was pretty delicious out of the oven, but it is PERFECT as cold pizza!!! I made it with some cubed prosciutto, mushrooms, and an italian cheese blend; used shredded low-fat cheese for the crust. thanks so much. I would have never believed cauliflower could resemble bread, but it was well worth the effort!! They must like my work! Good on me. This was delicious and I totally couldn’t taste the cauliflower. It did not taste like a bread crust, of course, and for some reason mine was quite soggy but I was just so happy to be having pizza! I don’t mind eating pizza with a fork and knife. I did double the recipe and baked for the longer time as recommended. So I have made this recipe about a dozen times. 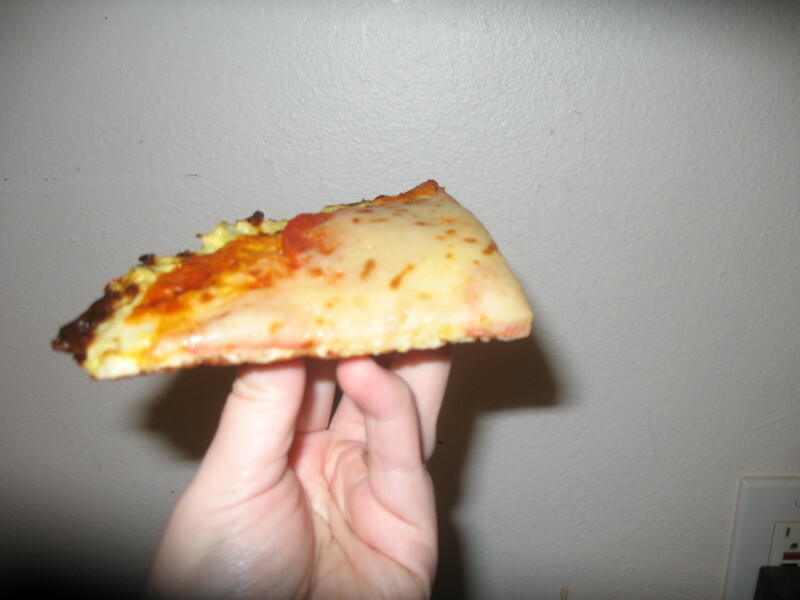 The flavor is fantastic, my family absolutely loves it, but like many others out there, I could never achieve the “pick up” pizza slice consistency as shown in the photo. I read through all of the comment (finally) and changed a few things up. 1) drained and pressed/blotted my steamed cauliflower with paper towels until it felt completely dry. 2) substituted 1/3 c. of Parmesan cheese and removed 1/3 c. of the cauliflower. 3) warmed the pizza sauce separately and put small dollups of sauce on the pizza with the toppings, instead of spreading a layer around the whole crust. I now have pizza I can pick up and enjoy with my hands! Hooray!! Thank you for this wonderful recipe… it is a all-time family favorite. I love knowing what worked for you. Thanks so much for sharing your process! How many servings in the whole pizza? HOW MANY SERVINGS IN THIS PIZZA? Omg! Love this Pizza. I use semi frozen cauliflower, grate it on the smallest cheese grater. Then micro for 3 minutes. Then I use my potato ricer to squeeze out the water from the cauliflower. 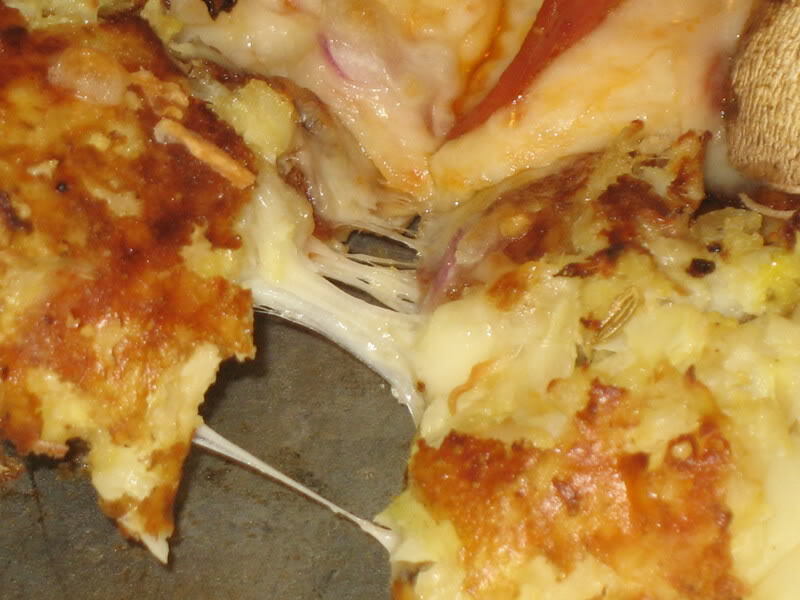 Mix with cheese and egg, then bake the crust on a well greased(olive oil spray). Even my husband loves it. So tasty!!! I spread mine really thin in the middle and worked my way out, and i picked mine up and ate it, i also added italian herb seasoning (the spices), fresh garlic, onion powder, garlic powder and pepper to the dough. baked it for 16 minutes, took it out put toppings on and broiled on low for 4 minutes came out PERFECT! I have never once written a comment on a blog, but I have to comment just this once. 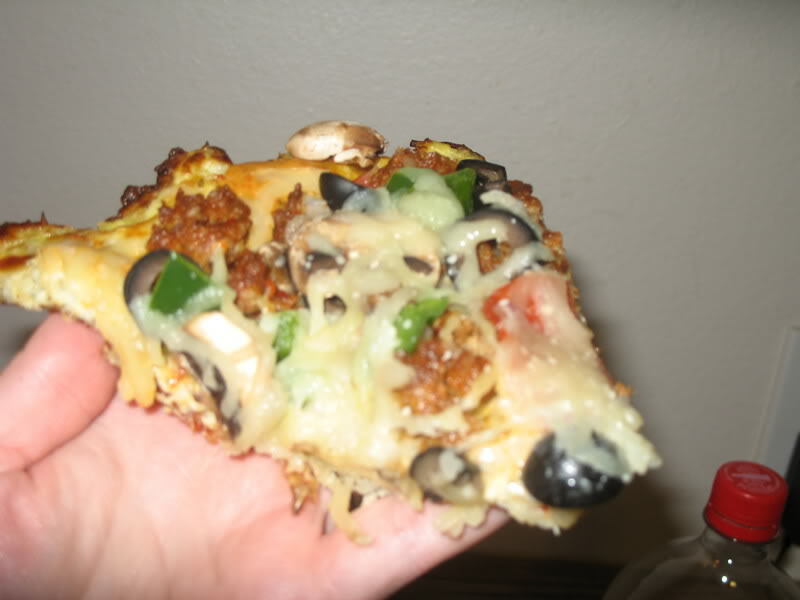 I am not a cauliflower fan and have tried other low carb pizza crust recipes before attempting this version. While the other cream cheese based crusts were OK, this crust literally blew them away. I could not believe that cauliflower could turn out to be the best traditional crust alternative I have ever had. Thank you, my family will be enjoying this for years to come!! this is the best thing I’ve come across in 6 months! my sister (a pizza lover) even liked it. I am a super picky person, but I sure do love having a slice of broccoli ricotta pizza at my local pizza place. I decided to try this cauliflower pizza dough and make my own broccoli ricotta pizza and OMG it turned out just as good as the pizzeria and had about 50 less carbs. Being a type 1 diabetic who loves pizza, I feel accomplished! (: Finally something delicious, not to difficult to make, and low in carbs for my blood sugar! So I had a go at making this today… it was absolutely delicious! However, my crust didn’t come out “crusty” the edges were crusty but the rest wasn’t 🙁 Any advice on how to fix this problem? I’d love to get it right since im a huge pizza fanatic. I see now that its best to squeeze as much liquid out of the cauliflower as possible, i will try that next time! I cannot believe how WONDERFUL this pizza is. My husband is stunned. I am amazed. Best find of the year. Huge hit with my whole family! I ended up making 4 pizzas! I use parchment paper it’s a huge help, with no cooking spray. Is the carb count for the crust only? How big should the diameter of the pizza be? How much sauce, cheese, etc.? Thanks! do you think there is some way we could make it without dairy?? Will it hold up with just the cauliflower and egg?? or should i add some almond flour?? Yay! Thank you! We made this tonight, and it’s my favorite gluten-free pizza so far. We eat 90% paleo, so I usually keep cauliflower on hand so the ingredients were simple, no crazy combination of flours, no yeast, no kneading, easy. And it tasted like pizza. My kids (who struggle quite a bit with the diet still, and are huge pizza fans) really loved it. I went fast and completely skipped the whole cooking the cauliflower part accidentally. I just riced raw cauliflower on low in my vitamix and mixed it with the cheese and egg, not until coming back here to comment did I realize the instructions say cooked. But the crust turned out great and not soggy at all, really had very much the consistancy of a doughy crust. So if anyone is short on time, you could probably skip that step. I made this tonight, and topped it with sauce, a little cheese, artichoke hearts, baby corn, and pea-meal bacon. It is one of the nicest pizzas I’ve had in ages! I riced my cauliflower with a cheese grater, and then cooked it in the microwave for 8 minutes. I didn’t add any water, and the resulting rice was nice and dry. I am delighted by how “crusty” the crust really is! Thank for this recipe!! It’s absolutely delicious. I have made it quite a few times now and it keeps getting better. You have given me back pizza night without all the guilt. I have done two post and credited back to your site. I want to try the chicken crust next, can’t wait! has anyone made this without the egg? we have an allergy and can’t eat eggs but really want to try the recipe as we are gluten free too!!! Is it ok to grate cauliflower first and then cook it in microwave steamer ? Or does it have to be cooked first and then grated ? I will be using fresh cauliflower,i cant find frozen , will this make any difference ? I am making pizza tonight using this crust, but roasting the cauliflower instead of boiling or steaming. I’ll let you know. f*ck the spray oil! f*ck the parchment paper! I slathered bacon lard all over the pan. it did not stick, and the lard helps it slide into my gullet, and wooooo boy, I am living large. but sveltely. and my boyfriend, who found this site, by the way, thinks I’m hot and said to type that in here. jamie, you low-carbiest hostess with the mostest, one thing: how many servings does this make? one? inquiring pizza minds want to know. yea so I made it just like you said, and wowee wow, it was good. toppings: kalamata olives, feta cheese, havarti cheese, and a second one with fennel sausage. Jamie, I made this last night with a few changes. I used a pizza seasoning that I make (and sell) to flavor the crust. It was amazing! I did use parchment paper and did not have a sticking problem. The recipe on the TV web page you referred to used a much lower temperature for the oven so I tried 400 degrees and my crust came out perfect. After my crust was finished I put on toppings (no sauce – hate pizza sauce) just a little olive oil sprinkle, chicken sausage, veggies and a bit more mozzarella and put it back in the oven for 10 min. I loved it so much I am making it again tonight as my husband was traveling yesterday and didn’t get to try it! Thank you so much! I am verklempt. I love that you didn’t cook the cauliflower. I might try that, too, knowing it’s not a necessary step! 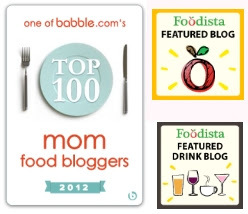 You rock, and your kids are so lucky to have a mom willing to play with her food so they can, too! That is an awesome way to prep the cauliflower. Plus you get she-rah points for grating by hand. I have skinned many a finger that way. We are shredder warriors! I am so happy that you like this recipe, Linda. I’m even more happy that you took the time to let me know. You are the best! I hope you like the chicken crust, too! You could make this without the egg. Just go with raw, processed cauliflower and cheese instead. I think if the cauli is raw when you process it, you likely won’t need the binding agent in the eggs. You don’t even have to cook it, Sondre. I didn’t realize that until very recently. If you buy frozen, just bring to room temp and make sure there’s no excessive moisture. Thank you for taking the time to write I am so excited to try this and I appreciate your feedback. I happen to love a crunchy crust and after reading many of the feedback it seems grating it dry might be a good shot too for a crunchy cruse. You made my whole evening. I hope you’re able to get things back to normal again soon. Fire situations are scary stuff. That sounds really delicious! The olive oil sprinkle and your description made me schmootz a little bit.